On the 16 February 2019 Dove Holes Jazz Club has The Frog and Henry Band making their inaugural visit to the Club as proud Dove Virgins and as part of their 2019 British Tour. They come with an impeccable, almost world-wide reputation that has been deservedly earned by their enthusiastic playing, of their brass and string instruments, of an extensive repertoire of old dance and jazz music. They are firmly convinced that over a period of ten years they have arrived at an ensemble sound that comes as close as is achievable to that of the earliest New Orleans Jazz and Dance Bands. Their journey has seen them come under the influence of The Dixieland Jug Blowers, Frenchy’s Stringband, Johnny Dodds and King Oliver not forgetting the Bull Ring Boppers. These experiences have given them the opportunity to gain invaluable knowledge of the ins and outs of what it takes to be a valuable member of a top notch street performing group. The orchestra’s young personnel have an undeniably colourful cosmopolitan look to them. 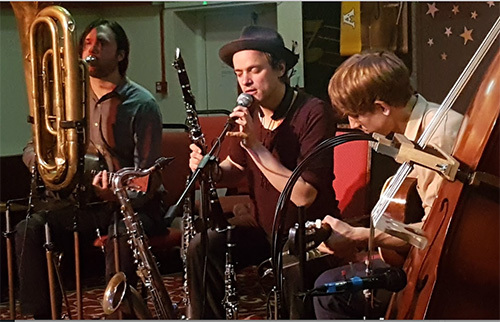 On this evening you will be enjoying the playing of Ewan Bleach from London on Reeds, Piano and Vocals, David Neigh with his unique foot operated Tuba that is played simultaneously with a six stringed, Mandolin Banjo. Dave is one of two musicians who are based in Torronto, the other being F H Henry who gives of his all on the Guitar as well as contributing with the odd Vocal. He is also to be found plying his trade with panache for a largish part of the year in New Orleans. The second spirited Reeds contribution comes from a Berlin resident who goes by the name of Laurin Habert whilst Kermane Arken who hails from the birth place of Jazz namely New Orleans features on Fiddle and Vocals. Tickets/enquiries to Roger on 01298-814722 or Barry on 07833-890928.